AND MY HEART IS OKAY. and it'll last forever and ever. i got this at work. it was very crinkly, it was rolled a bijillion times. 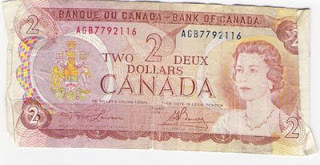 i remember when the 2 dollar bill changed into a toonie and i was kind of excited about it because i thought it had something to do with polar bears (i was like 5 at the time). i bought this in the winter for $1.95. i didn't start it until a few weeks ago when i was cleaning out my apartment. there are spots on the image where you paint with just one colour and the rest you paint with blended colours. i was feeling to lazy to blend the colours, so i just painted the part of the picture that required only one colour. 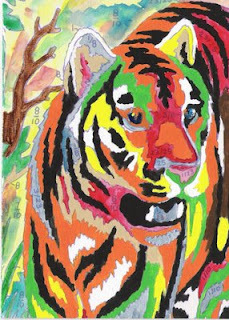 and then when i went to paint it again, the paint that had come with the paint by numbers had dried out and so i filled the rest in with my own made up see through colours.